Expirat Club launches a new season of ALTERNATIVA, a concept that will help you discover Bucharest’s underground scene. 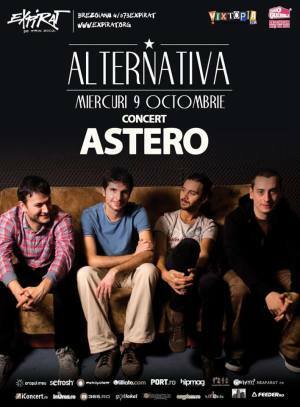 Astero = "emotional range of a tea spoon" A fresh combination of alternative, nu-metal, stoner and post-grunge. "ASTERO Concert @ Expirat" Concert in Bucharest. You can get here description, reviews, address, time and details of "ASTERO Concert @ Expirat" Concert in Bucharest. Visit Bucharest Tips for more Concert events in Bucharest!